The Cornelia W. Matthews Training Room is approximately 450 square feet and can seat up to 30 people. Both attractive and functional, it is equipped with WiFi access, a dry-erase board, wall-mounted 48? flat screen TV, VCR/DVD player, and telephone. On-demand pricing includes in-room coffee service and filtered water. HDMI cables, copy and print services, and catering available. Half-day rate of $300 is for 4 hours, either a.m. or p.m. All day rate of $500 is for 9:00 a.m. until 4:30 p.m. Weekly rates available. Reservation and Cancellation Policies for On-Demand Meeting Rooms and Touchdown Workspace •	Meeting Rooms are available Monday through Friday from 9:00 a.m. until 4:00 p.m. only. •	Any setup/decorating time and time needed to return the room to original set up must be included in rental period. 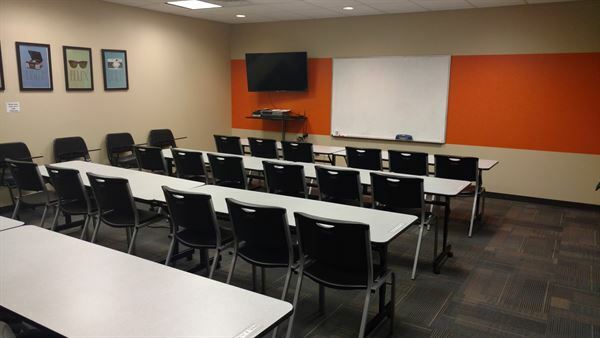 •	Meeting Rooms have a one hour minimum room usage charge. You will be billed for hours reserved if you arrive late or leave early, and billed for actual time plus $50 if you arrive early or leave late. Additional hourly periods charged for overages of 15 minutes or more into the next hour, when available. •	Room setup, reset, or additional cleanup by staff, if needed, will be billed at a rate of $30 per hour. •	Unless prior arrangements have been made, all reservations must be prepaid in order to hold the date. •	Catering menu available upon request. Catering prices listed above. Catering minimum charge due at time of reservation. •	Daily fee to bring in outside food & non-alcoholic beverages: $50 for groups up to 14, $75 for 15-24, $100 for 25-34, $150 for 35+. •	No refunds will be given for room rental purchases. Credit will be retained for future use if reservation is cancelled or rescheduled at least 72 hours prior to time of reservation. This room seats up to six and is equipped with a roomy square Ikea table. It includes WiFi access, a dry erase board, wall-mounted 32? flat screen TV with built-in DVD player, and telephone. On-demand pricing includes in-room coffee service and filtered water. HDMI cables, copy and print services, and catering available. The Cornelia W. Matthews Training Room is approximately 450 square feet and can seat up to 30 people. Both attractive and functional, it is equipped with WiFi access, a dry-erase board, wall-mounted 48? flat screen TV, VCR/DVD player, and telephone. On-demand pricing includes in-room coffee service and filtered water. HDMI cables, copy and print services, and catering available. The Bridge Building, a historical landmark located on the newly redeveloped Downtown Waterfront, offers the premiere Nashville destination for any special occasion. The modern designed building provides many customizable areas including a rooftop patio overlooking the downtown skyline. A perfect venue for weddings, private dinners, corporate events, holiday parties, or meeting spaces. Located in the heart of downtown Nashville, Tenn. on Second Avenue, The Quarter is the city's newest event space. With exposed brick and hardwood floors, the newly renovated space exudes historic charm while offering modern amenities. Located in the heart of downtown, Hotel Indigo offers urban appeal with timeless elegance. Enjoy stunning architectural features, hardwood floors and lofty ceilings. We can host intimate receptions and events for up to 150 seated guests or 250 cocktail reception in our Headlines event venue. Headline's ambiance, history and versatility set us apart from all other downtown event options. We also offer venue spaces for smaller groups of 20-60 guests as well as meeting spaces for up to 65 to as few as 6 attendees. Explore the venue that offers both historical significance and modern amenities when planning your event or meeting. Hotel Indigo also offers 161 sleeping rooms including suites to accommodate your guests all in one location! The Remington Room is an affordable event space that will be perfect for your special occasion in Middle Tennessee. You won't find another event venue in Smyrna, TN that offers such a unique venue at such an affordable price. With our linens, draping, uplighting and string lights included in every package, you save thousands in decorating costs right off the bat! The venue features a spacious lobby which can be used for a reception area or a photo booth. There is a kitchenette with a fridge, microwave, sink and countertop space for prepping food. A second private room can be used for food service or could be a bridal suite for a wedding party. The main party room is approximately 1550 square feet. WiFi is available. Outside food and drink are allowed. Wedding Arch, Bar, Centerpieces, PA System, AV Equipment, DJ Lights and Photo Backdrop are all available to rent in house. 12th & Porter underwent an expansion and renovations in early 2015 to make the venue more navigable for guests. The facility now features state-of-the-art sound and production equipment that is rarely found in venues of its size. 12th & Porter is perfect for your next party or social event. For private booking or corporate events, please email or call us directly. A Collection Of Truly Unique Nashville Wedding And Event Spaces Horton Events is a one-stop shop for event needs. Our event team has more than a decade of experience planning memorable events. We believe the key to creating lasting memories is bringing the experience to life. From the venue to decorations to the food choices and activities, we make sure that your event provides guest with a 360-degree experience. Our venues are located throughout the Greater Nashville area. From Downtown to the Gulch to Madison, our venues offer a warm and inviting atmosphere for any and all events! With our collection of venues, our events team can help you select the quintessential event space that is ready for anything you can imagine. Fantasy Hall is a gorgeous, family owned, multi-use event facility. The venue has a capacity of 200 people seated and many possible configurations for a wide range of events, from private parties, banquets and wedding receptions, to business meetings or organizational events. Nashville's Newest Downtown Event Spaces. This historic church location, dating back to 1874, has been transformed to a modern open floor plan venue. Exposed beams, natural light, upper level mezzanine, full on site kitchen, bridal lounges, and state of the art light and sound are sure to make this venue one of the most desired spots in downtown Nashville. Accommodating seated dinners for up to 400 and cocktail style receptions for 700, this location is the single largest free standing downtown venue.